First announced in February, the new Corsair ONE pre-built gaming PC is now shipping. The Corsair ONE is the first ready-to-run system from the manufacturer that has mostly been known for their PC components and peripherals. Selling and supporting entire systems is a new venture for Corsair, but the design and capabilities of the Corsair ONE are a good fit for the company's product lineup. 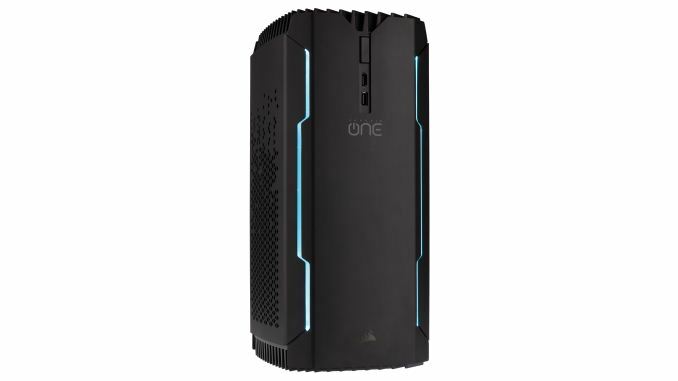 The Corsair ONE uses a custom case form factor that is a shallow-depth mini tower, but all of the major components inside use standard PC form factors: mini-ITX motherboard, SFX power supply, 2.5" SSDs and supporting graphics cards up to 11" long with two or three slot cooling solutions. Naturally, many of those components are either existing Corsair parts or special editions made for the Corsair ONE. The total volume of the case is around 12L and the exterior is mostly black aluminum. The system's cooling is provided by a single ML140 exhaust fan at the top and intake is through the side panels. The right side intake is occupied by the radiator for the CPU's closed-loop water cooler. The left side intake vent opens directly onto the air-cooled graphics card in the base model, while the top Corsair ONE includes a second water cooler for the GPU. Neither radiator has any fans of their own, as the exhaust fan at the top of the case provides most of the air flow. The power supply uses semi-passive cooling with its own fan, and the system as a whole emits around 20dB at idle. In order to allow the graphics card to be positioned behind the motherboard and facing its own air intake, the Corsair ONE chassis provides the necessary cables to route the PCIe lanes to the graphics card, and pass-through video connections to ports on the back and one HDMI port on the front that is intended for VR displays. The power supply is mounted in the top of the right side of the case and also makes use of a short pass-through cable to the plug on the back of the machine. Because both side panels are used as air intakes, the Corsair ONE can only operate in vertical orientation cannot be operated with either side directly against any obstructing surface. The top vent and fan are removable without tools, but the two side panels with the radiators must be unscrewed at the top and are hinged at the bottom. While Corsair cases are usually quite easy to work in, further disassembly of the Corsair ONE gets tricky as usability has been sacrificed to save space. The base model Corsair ONE comes standard with an Intel Core i7 7700 processor in a Z270 motherboard with 16GB of DDR4-2400 RAM. The base graphics card is an air-cooled NVIDIA GeForce GTX 1070. The Corsair ONE PRO model upgrades to a Core i7 7700K processor and a MSI GEFORCE GTX 1080 AERO 8G OC with Corsair's custom water cooler. Storage is either a combination of a SATA SSD and a 2.5" hard drive or a single larger SATA SSD. Stylistically, the Corsair ONE is less ostentatious than many gamer-oriented products. The front face of the case includes aqua blue accent lighting that can be controlled or entirely disabled through Corsair Link software, but it's single-color rather than full RGB lighting. Even with the lighting off the Corsair ONE doesn't easily blend in with typical office or living room furnishings, but the relatively small size and all-black color scheme make it fairly unobtrusive. The software pre-installed on the Corsair ONE is minimal: Windows 10 Home with all the necessary drivers, Corsair's CUE customization tool, and installers for popular game digital distribution platforms including Steam, Origin, Uplay and GoG Galaxy. Corsair will be selling the Corsair ONE PC through major electronics retailers as well as directly through their online store. Support will be be handled in-house by Corsair's expanded support department that now includes specialists for the Corsair ONE. The system comes with a two-year warranty and aftermarket upgrades performed by the consumer will void that warranty, but Corsair will also be partnering with retailers to provide in-warranty aftermarket upgrades.